(Compton, CA) - June 1, 2006 – Belkin introduces its PureAV Mercury Series Interconnects, its new flagship line that utilizes advanced technologies and cutting-edge materials to ensure the most powerful and dynamic audio video experience possible. Mercury Series will ship in North America in September 2006, with launches in Asia, Europe, and Australia to follow. They will also be on display at the Home Entertainment Show 2006 in Los Angeles, CA, June 1–4 in Suite 201. Mercury Series Interconnects provide a sharper, more vivid picture and more natural, state-of-the-art sound quality, as well as maximum rejection of noise and interference that can compromise your entertainment experience. Utilizing the finest-quality materials, innovative technology, and manufacturing methods, these Interconnects extract maximum performance out of high-end AV equipment. The line will consist of the following interconnect formats in various lengths of 2 to 16 feet, starting at $500. Mercury Series Audio Interconnects utilize a unique multi-gauge, hybrid-conductor design, which combines various conductor types and sizes based on their areas of best performance, to produce a cable that excels in every frequency range. Since frequencies travel at different depths through a conductor, they can become congested and interact with each other. This causes music and movies to lose detail, making it difficult for you to hear dialog or lyrics. Hybrid-conductor technology uses three distinctly different conductor types to handle the bass, midrange, and high frequencies. Combining them together in the proper ratios yields a cable that is superior throughout the audio range, giving a balanced, full-range response so you can hear every detail, lyric, and dialog as the creators of the audio content intended. The copper quality of conductors largely dictates cable performance. The best results are derived from the optimal crystal structure and the purest oxygen-free copper (OFC) to eliminate impurities and deliver low loss, and low-distortion signal transmission. 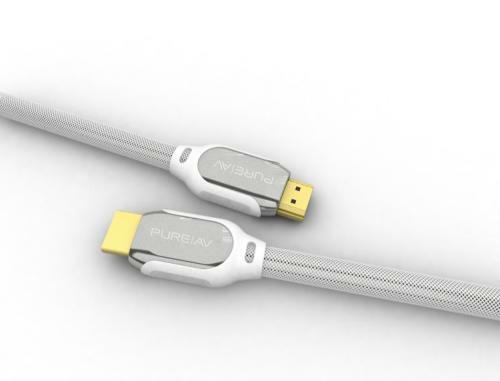 PureAV Mercury Series Interconnects use the finest-grade, PCOCC copper conductors, which are essentially mono-crystal and 99.9999-percent oxygen-free in purity. Well-regarded in audiophile circles, this material typically appears only in top-of-the-line cables. PureAV’s PCOCC process creates a single long-length copper crystal with exceptional transmission properties, radically reducing the distortion caused in standard OFC. This results in maximum definition with cleaner, more detailed sound and clearer, more vibrant pictures. Furthermore, the Mercury Series Video Interconnects utilize a full RG6 spec (1mm rather than the commonly used .8mm spec) and multiple gauges for lower resistance and longer signal transfer between different frequency ranges. In video cables, the PCOCC conductor is then 2.5-percent silver-plated, offering superior conductivity to copper, for the best high-frequency response possible. Since video frequencies are mostly higher frequencies, the signal travels primarily at the surface where the silver plating is a significant advantage due to higher conductivity. Silver plating produces a stronger signal, with less loss, better clarity, and richer colors. PureAV Digital Optical Interconnects are constructed of multi-core glass fiber, ensuring the lowest possible signal loss and digital error (jitter). Utilizing multiple fibers creates less ability for light to scatter, which results in less signal-delay error and distortion, and better signal transmission. This ensures superior sonic accuracy. The precision-polished optical terminations further eliminate loss, resulting in better high frequencies, and a more realistic stereo image. Mercury Series Video Interconnects are shielded five times for maximum rejection of interference. Copper-braided shields are silver-plated for the lowest possible noise. Furthermore, nitrogen skin-foam-skin dielectric ensures a smooth concentric surface for consistent and accurate impedance. Mercury Series Interconnects utilize precision-machined, gold-plated, locking RCA connectors for maximum conductivity, and the most secure possible connection. Belkin Corporation, the global leader in connectivity solutions, launched its PureAV line in January 2004. Since then, the line has received numerous design awards from iF, I.D., CES, Business 2.0, and others. It has also garnered much praise from respected experts and publications in the AV field.